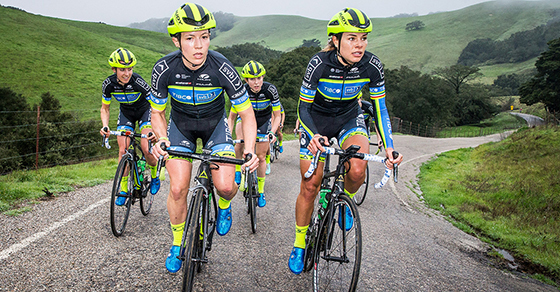 Team TIBCO-Silicon Valley Bank is the longest running women’s professional cycling team in North America. Linda Jackson, a Stanford MBA and former investment banker, founded the team in 2004 to help promising female cyclists achieve their Olympic aspirations. Cycling is one of the most popular sports in the world, and Silicon Valley Bank has been a sponsor of the team since 2006. We interviewed Jackson, who has applied her business background to building the team, and several team members to learn their tips for success. Whether cycling or building the next disruptive technology, nobody can do it alone. The winner of the race, Jackson says, isn’t only the woman standing alone on the podium, but the team that got her there. Here are some insights that may apply whether you are racing toward the finish in a road race or the next development deadline. While recovering from a ski accident, Jackson tried cycling for rehab. As she tells it: "I gave up investment banking to follow my passion of cycling and my dream of becoming an Olympian. I ended up making the 1996 Olympic team (representing Canada), and the experience really changed my life. I decided to dedicate my life to helping other women achieve their goals." Jackson grew the team from a small local group ranked 60th in the nation in 2005 to the top female cycling team in the country in 2009. Today, the team of 12 consists of women from six countries on four continents and competes at the top level in the world. Women’s cycling teams attract only a tiny portion of the sponsorship revenues that men’s teams do, mostly because there is less media exposure. One well-known race sponsor told Jackson early on that she was wasting her time. The experience of looking for partners willing to invest without an easily measured ROI, and then managing their expectations, closely mirrors the entrepreneurs’ experience. Says Jackson, succeeding often requires satisfying the objectives of your partners and convincing them that your strategy will win the day. Lex Albrecht, who has represented Canada at three World Championships, fell in love with the sport as a child, drawn by the sense of freedom and accomplishment cycling gave her. She recalled setting a goal to buy her first road bike, and how she felt when she had finally saved enough after a year: "It was a powerful reward. I just kept moving forward, setting higher goals and maintaining my dreams," she says. By college, she saw cycling as a way to balance her rigorous student life while earning a medical biology degree. She went pro at 24, following her gut and leaving her medical research career path. "I chose to believe in myself, not only to succeed but also survive." she says, and is in her sixth season as a pro. " The early years were not that glamorous of a lifestyle. "When you are passionate about something you find ways to see the bright side on a whole bunch of different challenges, to stay hungry and go after your goals." Team TIBCO-Silicon Valley Bank team has a reputation for finding emerging talent and developing them into world-class athletes, not necessarily hiring the stars. "You don’t necessarily need the best riders to become the best team," Jackson says. The key to winning in sport and in business is to foster an environment where team members are focused on the overarching goal, not individual goals or recognition. When recruiting, she considers physical skills, personalities and life experiences, not just what the women can do on a bike: "Mental strength is what separates the winners and losers." Adds Albrecht. "You need amazing chemistry and trust to bring the best out of each other. That’s when you get good results." When the chips are down or progress is lagging you have to keep challenging yourself, advises team member Heather Fischer from Boulder, who finished first in the 2016 U.S. National Team Time Trial. "To be the most successful, I learned I can’t just stick with what I am doing. Good athletes, the really good ones, constantly challenge themselves, continuing their education, getting a new coach," she says. After Brianna Walle’s male boss noticed her spirited riding to and from work (she would pass him up on Portland, OR streets), she said he offered to introduce her to racing. She was intimidated by the notion of racing and the expense: "It took a year and a half, and then I got hooked. My boss believed in growing the sport, his passion inspired me to keep going." She had to redouble her efforts last year, after a devastating crash during a race resulted in a major concussion. But she has not let it derail her cycling career. She said talking about the scary incident has helped her recover. She consulted an expert, in this case a sports psychologist, to help mend mentally and that has given her the confidence to get back on the bike. Being a woman in a male-dominated sport has its plusses and minuses. When there aren’t women’s races, sometimes team riders join the men and smile at their reactions when they whiz by them, says Fischer. The key, say the racers, is not to be intimidated no matter who you are racing against. "Look at the peloton, see who is the good climber. If they are better than you are in a certain skill, you can’t be intimidated by [a competitor’s] strength. You have to outsmart them, surprise them, go at a different time." Team Captain Lauren Stephens is a former Texas high school math teacher, and recognizes that girls and young women who initially are motivated to pursue a STEM degree or bike racing career often lose interest by the time they reach their mid-teens. "You will see at national cycling competitions 50 to 60 girls in the 13-14 age range and then 12 girls aged 16-18. There’s no pipeline." Akin to STEM careers, part of the reason, says Jackson, is that girls don’t see much future opportunity or female role models. She and others in the women’s cycling world are trying to change that. Jackson attends several meetings a year in Europe with the UCI (the governing body of the sport) to try to boost opportunity and pay for women in the growing sport. "If you aren’t happy with the state of things, you have two choices: accept the status quo, or do something about it," says Jackson.